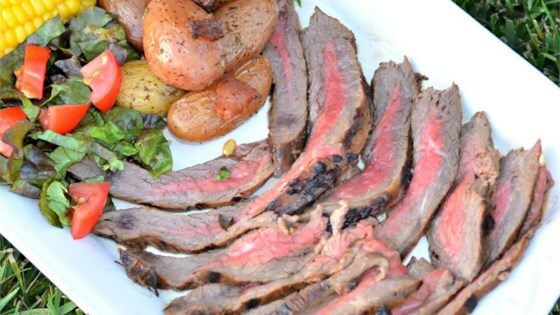 "This recipe makes a quick and easy overnight marinade for a grilled flank steak." Whisk vegetable oil, soy sauce, red wine vinegar, lemon juice, Worcestershire sauce, mustard, garlic, and black pepper together in a bowl; pour into a resealable plastic bag. Add flank steak to the bag, coat with the marinade, squeeze bag to remove excess air, and seal the bag. Marinate in the refrigerator 8 hours to overnight. Remove steak from the bag and shake off excess marinade. Discard remaining marinade. Cook the steak until beginning to firm and is hot and slightly pink in the center, 5 to 7 minutes per side. An instant-read thermometer inserted into the center should read at least 140 degrees F (60 degrees C). Rest steak 5 to 10 minutes before slicing across the grain. The marinade left a very vinegar taste behind. Will not make again. Fantastic recipe! We've made it twice now, makes a typically tough piece of meat tender, and full of flavor. It is a family favorite now. Cooked it on our Traeger. Very good and easy. Marinated the flank steak overnight, then came home from work and threw it on the grill.